MyOMaps needs a geo-referenced map file and a course file. These files are in standard formats and can be easily produced in OCAD. Export your OCAD map (not the course file, but the underlying map file) as a KMZ file. You will need Version 10 or later of OCAD to support geo-referenced OCAD maps. MyOMaps needs the coordinate system to be set to UTM/WGS84. Select the applicable Zone and Hemisphere relating to the location of your map. It is best to keep the size of KMZ files to be of the order of 1MB. You may need to reduce the dpi to achieve this. It is best to use the same base name for the KMZ file as the file name of your OCAD file so that you can remember which version of the OCAD file was used to produce the KMZ. It is also useful to append to the name, the dpi resolution of this file. Eg If a 150dpi KMZ is produced from an OCAD file with the name "Taringa 2015v2.ocd", the recommended name for the KMZ file is "Taringa 2015v2 150.kmz". 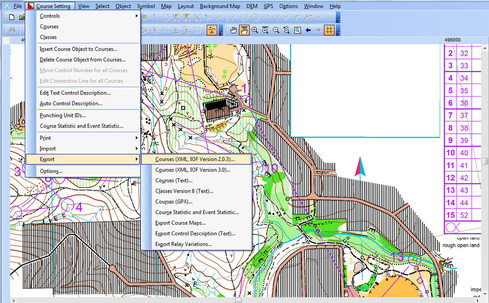 Some features of MyOMaps (eg Score Events) rely upon there being only a single course in the course file and the course being named: "Course1". Also the Start should be named "S1" and the finish "F1". Currently V3 of IOF XML is NOT supported. This creates an XML file that contains details of the course and the location of each of the controls (in both x,y mm on the map page, and easting and northing in WGS84). This can lead to some inaccuracies, and the position of controls should be checked. 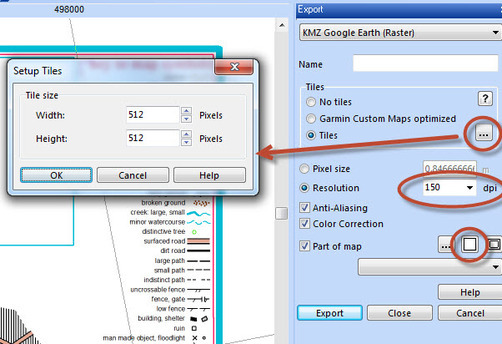 If you use these non-geo-referenced systems, care must be taken to use a map that is the same boundaries, rotation and top-left corner as the Map used to create the KMZ file, otherwise the x,y coordinates in the course file will not be correct for the KMZ file. Alternatively, an administrator can publish your event on the MyOMaps server. The event can be PIN protected for confidentiality. - There is only one course in the file, with the name "Course1"
- The start is named "S1" and the finish "F1"